It seems that Tesla board member Kimbal Musk was not kidding when he noted in a CNBC Closing Bell segment that the number of Model 3 which would appear in US roads near the end of September would be shocking to some. After Tesla’s volunteer-boosted delivery weekend — which saw members of the community dedicating some of their time to help out new owners with the features and functions of their electric cars — it is starting to become evident that Q3 2018 could be the quarter when the Model 3 starts its invasion of the US passenger car market. The Model 3 is Tesla’s most ambitious vehicle. Radically designed from the ground up, the Model 3 was the car that would determine Tesla’s future. Elon Musk himself dubbed the vehicle as a “bet-the-company” situation, where its success or failure would equate to Tesla’s own rise or fall. It took a while for Tesla to hit its stride with Model 3 production, with the company only hitting its then-mythical goal of manufacturing 5,000 of the electric sedans in a week by the end of Q2 2018, six months later than initially expected. The Model 3 has started to show its potential in the US passenger car market over the past months. Back in July, sales estimates from auto tracking website GoodCarBadCar suggested that Tesla sold 14,250 Model 3 in the month, making it 7th place in America’s list of best-selling passenger cars. Considering that mainstream, lower-priced vehicles like the Toyota Camry and the Honda Civic were included in GCBC‘s list, the Model 3’s 7th place was more than respectable. While the Model 3’s sales in July were undoubtedly impressive, its August estimates were even more noteworthy. With an expected 20,450 units sold during August, the Model 3 became the 5th-best-selling passenger car in the US, beating out the Hyundai Elantra and the Nissan Altima. The Model 3 was even listed as the 15th-best-selling vehicle in GCBC‘s overall Top 20 list, which includes titans like the Ford F-150 and the Toyota Rav4. It is no secret that Tesla has a tendency to initiate a blitz of deliveries and production before a quarter ends. The company did this in Q1 when it was struggling to build 2,500 Model 3 in a week, and it adopted the same strategy for Q2 when it was trying to manufacture 5,000 of the electric sedans in a seven-day period. This third quarter, Tesla is aiming to produce 50,000-55,000 Model 3 — a record number of vehicles — while attaining profitability. For the company to get a shot at achieving these targets, cars have to be delivered to reservation holders. These efforts, of course, culminated in the recent volunteer-boosted delivery weekend. 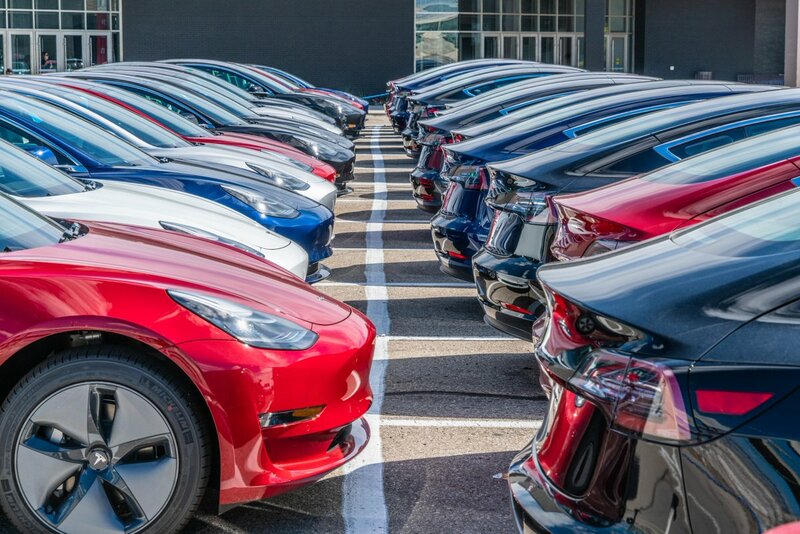 As the Tesla community was mobilized in the United States and Canada, it soon became apparent that the company is moving a vast number of vehicles. In the United States, social media posts from Tesla owners shared images of numerous semitrailers transporting electric cars all across the country. Anecdotes from owners who volunteered in the weekend delivery push indicated that numerous vehicles were being moved to service centers, where reservation holders await them. Even a journalist who covers Tesla on a consistent basis shared a clip of a truck full of Model 3 being transported. In Canada, members of the Tesla community have also spotted large lots filled with Model 3, Model S, and Model X. Images taken of centers in British Columbia, Vancouver, Toronto, and Ontario, also depicted a busy, yet very productive volunteer-boosted weekend. In a letter to employees, Elon Musk wrote that Tesla is “about to have the most amazing quarter in (its) history, building and delivering more than twice as many cars as (it) did last quarter.” Kimbal Musk, for his part, noted that “it’s really gonna blow people’s minds how many Model 3s are gonna appear in America in just the next couple of weeks.” If Tesla’s busy delivery weekend, as well as the apparent invasion of electric cars being sighted in the US and Canada, are any indication, the company might very well exceed expectations this quarter. It will not even be surprising if the Tesla Model 3 moves up a couple more steps in GoodCarBadCar‘s list of best-selling passenger cars in the US for September. Tesla has only been in the auto industry for 15 years, and over that time, it has transformed itself from a niche manufacturer that offered one small, quick, two-seater all-electric sports car into a company that is taking on veterans with premium electric cars that force legacy carmakers to come up with compelling EVs of their own. Tesla still has a long way to go before it masters the auto business, and Elon Musk himself would be the first to admit that gross miscalculations, such as the Model X’s overcomplicated design and the Model 3 ramp’s over-reliance on robots, have happened in the past. Despite this, Tesla remains a company that commands a strong following — one that is willing to pay it forward when needed.